Greener than green, this vegetable looks as beautiful on the plate as it tastes. 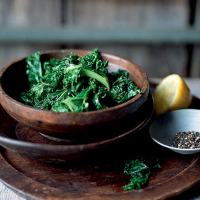 Put the kale in a large saucepan with boiling water. Cook for 3-4 minutes until tender. Drain and place into a heated serving dish, stirring in the lemon juice. Season and top with the butter.